Arkansas head football coach Chad Morris announced the hiring of Trumain Carroll as the program’s head strength and conditioning coach on January 9, 2018. Carroll most recently worked with Morris at SMU, where he was the Mustangs’ strength and conditioning coach for the last three seasons (2015-17). Carroll joined the SMU staff after two seasons (2013-14) as assistant strength and conditioning coach at his alma mater Oklahoma State, his second stint with the Cowboys. During his tenure at SMU, Carroll’s efforts in the weight room aided in the development of wide receivers Courtland Sutton and Trey Quinn into All-Americans and future NFL Draft selections. Sutton and Trey Quinn at SMU were two of the most dynamic wide receivers in college football in 2017, each turning in 1,000-yard receiving seasons to become one of only to pairs of teammates in the FBS to accomplish that feat. A projected first-round pick in the 2018 NFL Draft, Sutton posted career receiving totals of 3,152 yards and 31 touchdowns on 189 receptions in four seasons at SMU. He averaged 16.4 yards per catch in each of his last two seasons, and finished third on the Mustangs’ all-time receiving chart behind Emmanuel Sanders and Aldrick Robinson. Quinn, a semifinalist for the Biletnikoff Award and Earl Campbell Tyler Rose Award, led the nation in receptions with 114 and ranked inside the top 15 nationally in receiving touchdowns (No. 4, 13), receiving yards per game (No. 10, 95.1) and receiving yards (No. 11, 1,236). He posted two of the three top reception performances in the FBS during the regular season with 17 catches twice and became the only player this century to register 15-plus catches in three straight games. Prior to Oklahoma State, Carroll was director of strength and conditioning South Carolina State (2011-12) after serving in the same role at the University of Missouri-Kansas City (2008-11). Carroll joined UMKC from Oklahoma State, where he was the assistant strength and conditioning coach from 2006-08. While in Stillwater, Carroll designed and directed the strength program for the Oklahoma State women’s basketball program that advanced to the Sweet 16 in the 2007 NCAA Tournament. He also assisted in the strength and conditioning program with the Oklahoma State football team that won the 2006 Independence Bowl and the 2007 Insight.com Bowl. Carroll was defensive end at Oklahoma State from 2001 to 2005. 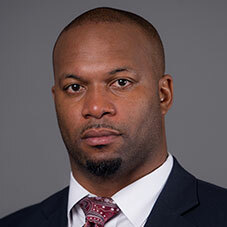 During his playing career, he helped guide the Cowboys to three consecutive bowl games, including a victory in the 2002 Houston Bowl and appearances in the 2003 Cotton Bowl and 2004 Alamo Bowl. Carroll received his Collegiate Strength and Conditioning Coach Certification in May 2007 and his USA Weightlifting Sports Performance Certification in February 2008. He earned his bachelor’s degree in business administration from Oklahoma State in December 2005. Carroll and his wife, Jarne, have a son, Trumain “Deuce” Carroll and a dog, Bo.